Shifting elegantly from academic to personal, this memoir offers spiritual insights into Alzheimer’s caregiving. Where Two Worlds Touch: A Spiritual Journey Through Alzheimer’s Disease joins a growing number of paradigm-shattering books that are confronting the belief that an Alzheimer’s disease diagnosis is a tragic thing. Quite to the contrary, Jade C. Angelica says that if one chooses to lean into Alzheimer’s rather than recoil from it, Alzheimer’s can be a consciousness-shifting experience. 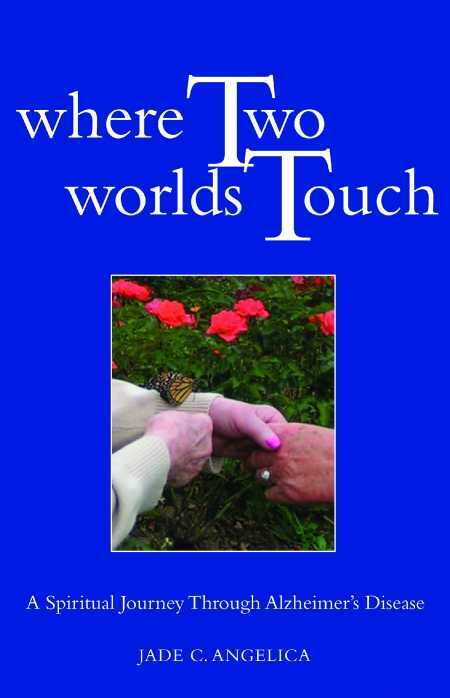 Where Two Worlds Touch is a dense read that effortlessly dances from serious to heart-wrenching stories from the trenches of Alzheimer’s “carepartnering.” Angelica segues in and out of the several years she spent as the primary carepartner with her mother as they journeyed through Alzheimer’s, using their daily struggles and joys as a vehicle to explore the past. For example, Angelica’s conflicted feelings about her mother’s inability to protect her from childhood sexual abuse and other longstanding issues between them dissolved into an unconditional loving forgiveness by the time her mother passed away. The consciousness-raising and worldview-shifting insights found in Where Two Worlds Touch might have a positive systemic impact on society if it were to become the go-to book for those whose lives are touched by Alzheimer’s.